Tyler Reid is twenty three, grumpy and angry, trying to take care of his injured brother, while rebuilding a life blind hatred destroyed in one night. As the summer passes and the years turn, as Chase cares for Tyler’s brother, as he helps rebuild the house in the woods--as they help each other rebuild a life beyond the little house, Chase realizes two important things: these men matter to him, could be family. 5.0 out of 5 starsAngsty, emotional, drama filled goodness! I've read books by this author before, but this is the first PNR I've read by her (possibly her first published?!?) When I read the blurb, I couldn't help but be totally intrigued. There was so much that grabbed my attention! And then I got started..... I read this book within a matter of hours, unable to put it down. It was absolutely amazing! This book centers around a teenage boy, who is working his way through a pretty traumatic series of events. His loneliness leads him to a couple of brothers, who had themselves had something pretty horrific happen to them. They forge a friendship that begins to rebuild the lives of all three of them. The bonds they create stand the test of time, and lead to things none of them could have ever saw coming. Slow Shift, to me, was less about romance (don't get me wrong, this book was HOT and there was lots of romantic angst involved!) and more about the importance of family, whether it be the one you are born to or the one you make. Just a few warnings though. This is not the kind of book that can be read a bit at a time. There is so much going on, you won't be able to put it down. This also isn't a light hearted rom-com, that you will get a few laughs out of. This book was full of angst, drama, and very emotional. (Definitely, don't take it to work!) But in all seriousness, this book was definitely one I'd read again, and would recommend to my friends. Slow Shift is Chase DeWitt & Tyler Reid’s story. This book caught my attention from the beginning. This book was so good that I had to read it while at work at every free moment that I had. Slow shift is a shapeshifter story. With Werewolves, witches and druids, oh my! I thought that this story was told in an original way. Chase’s mother dies when he is 14 years old. He is grieving his mother when he finds an old home in the woods. Chase worms his way into Tyler’s life when he was only 14 years old and he was a grieving young man after his mother died. Tyler also had family die and he was taking care of Lucas, his brother who was in a catatonic state. Ever since the accident that killed Tyler & Lucas’s family. 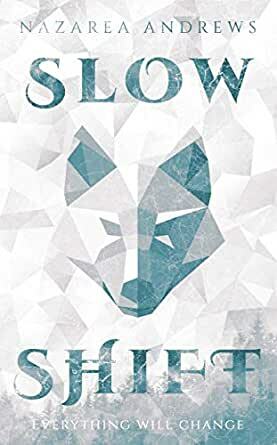 Slow Shift tells a very good story and I hope that there will be more books. I loved this story. 5 stars for sure! Lovely, absorbing, fierce, and satisfying. I enjoyed the narrative style--third person, present tense, multiple POVs, and chapters that are multiply-subsectioned. I also enjoyed the periodic brief disorientation when it wasn't instantly clear whose POV was foreground. For me, the momentary confusion enhanced my sense of immersion in the shifting realities of a magical universe. Well done, Nazarea Andrews! 5.0 out of 5 starsTruly excellent! Great coming of age love story that has a little bit of everything. Story that is meant to be savored and enjoyed!